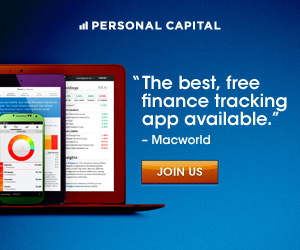 YOU ARE HERE:Home » Investing Commentary » Why Did the Stock Market Crash and What Should Robo-Advisor Investors Do? 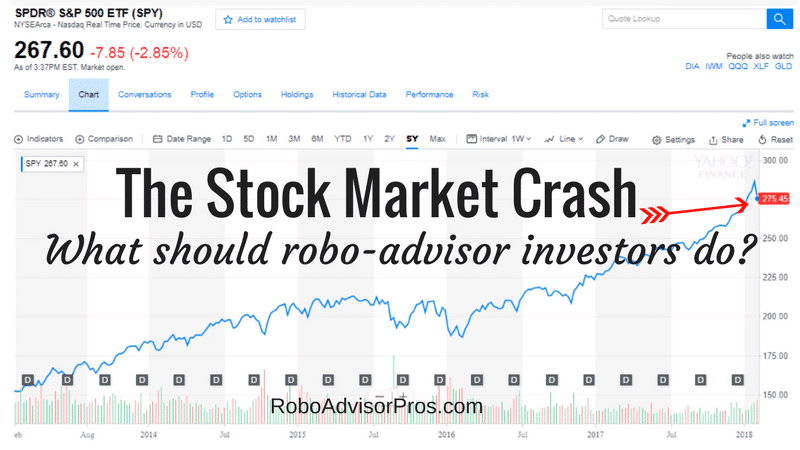 Why Did the Stock Market Crash and What Should Robo-Advisor Investors Do? February 5, 2018 the stock market crashed, following a dive on Friday. At the end of the day, all 2018 gains have been officially wiped out, according to CNBC. The S&P 500 fell 113.14 points for a -4.10% decline, with the Dow 30 dropping 1,175.28 points for a -4.61% loss. The NASDAQ, home to many tech companies, saw a 273.42 fall of -3.78% and the Russell 2000, more representative of the overall market, fell -46.51 or 3.01%. The stock market was overvalued and needs to decline to return to fair value. Janet Yellen left as Fed Chair and the new Chief Jerome Powell took office and markets are testing the new Chairman of the Federal Reserve bank. Investors fear that inflation is picking up, since wages are increasing. Investors and professional money managers worry that increasing interest rates will curtail corporate profits. The programmed trading is on a tear and out of control, according to Jim Cramer, of CNBC. In fact, it doesn’t matter why the stock market declines. Stock markets go up and down in value and it is normal for values to drop. I think it’s a good thing that the markets fell, because the stock prices were overvalued. Now, they’re moving closer to fair value. If you’re a long-term investor, after a stock market crash it might be a good time to buy. After all, stock market prices are cheaper now than last year, and who doesn’t like a sale? The underlying fundamental properties of the stock market companies has not changed in the last several days. The sales, earnings, growth prospects, debt levels and more are the same as they were before the stock market crash. So, whatever the reasons for the fall, you need to consider whether you think that American and international businesses will continue to grow in the future. If you believe that the U.S. and world economies are basically sound, and will grow in the future, then there’s no reason to panic when the stock market crashes. And, if you lack confidence in global and U.S. economies then you should keep your money in cash! Most robo-advisors invest in exchange traded funds that mirror market indexes. So, when the indexes drop, so will the value of your investments. So, don’t be surprised when the value of your robo-advisor portfolio falls. That was why you completed a risk tolerance questionnaire in the first place. 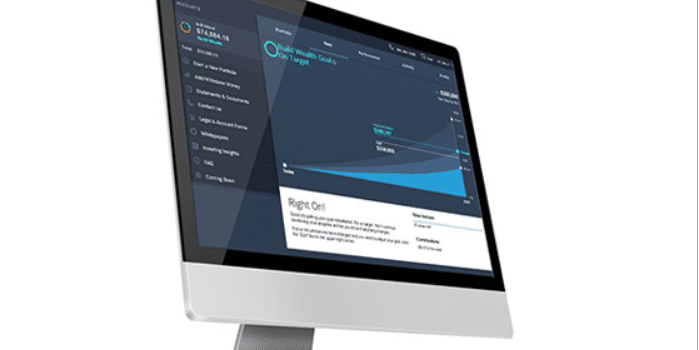 The initial risk tolerance questionnaire that a robo-advisor presents is created to determine how you would respond in just this situation, when markets tank. And, if you claimed that you would freak out with the smallest market drop, your portfolio will have a greater percentage of less volatile bond funds and a lesser proportion to stock funds. On the other hand, if you indicated that you were more risk tolerant, and had a longer time until you would need your money, you probably have a greater percentage of stock investments. Consequently, if you’re a more aggressive investor, you’ll see a greater drop in your portfolio value today, than a more conservative investor. That’s just how investing works. Today, after a huge market drop, is a perfect example of why you never put money in the stock market that you’ll need within the next few years, because market corrections happen. 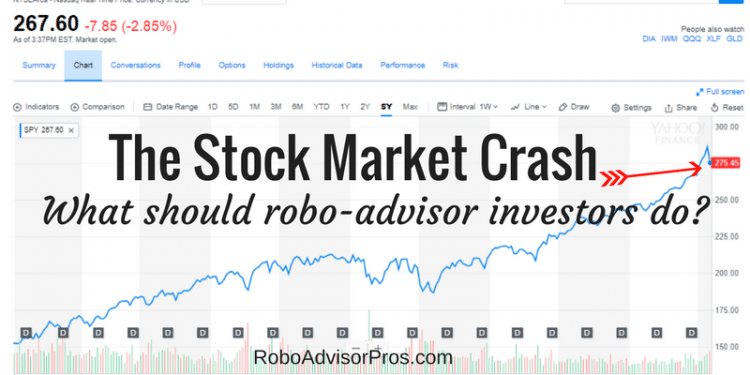 What Should Robo-Advisor Investors Do After a Stock Market Crash? After markets crash, robo-advisor investors have two viable choices. First, after a market crash, you can do nothing. Robo-advisors in general provide investor education that explains the volatility of investment markets. So, if you did any due diligence before investing in your robo-advisor, you already understand that your investment values might crash at some point. If history is any guide, your investment values will ultimately rebound, and continue to grow. Second, after a market crash, you can invest more money. Personally, after every recent market crash, I’ve increased my stock market fund investing and never regretted it. During the decades that I’ve been investing, markets have rebounded. So, despite losing money during a crash, I’ve capitalized on the opportunity to compound my long-term wealth by buying stocks on sale, after a market drop. Despite recent market declines the Dow is up over 30% since Trump took office driven by strong corporate profits, healthy economic growth and enthusiasm about the tax cut for businesses. Examine the 5-year chart of SPY the most popular S&P 500 index and you’ll notice that the recent market volatility is a blip on the long-term screen. Robo-advisor investors and DIY stock fund holders should relax and continue investing for the long term. Selling after a market drop only locks in your current losses and cuts your opportunity to participate in the market rebound.